2017 has been a great year for peppers in my garden. The total harvests so far have come to 112.7 pounds which I split into sweet and seasoning categories. Sweet pepper harvests have totaled 87 pounds and seasoning types 26 pounds. That's a vast improvement over the 2016 harvest total of 50 pounds of all types of peppers from a similar number of plants. So what to do with all of those peppers? Other than eating a fraction of them fresh from the garden I've been preserving them. My dehydrator has been humming along for much of the past couple of months and my latest preserving efforts have been experiments with fermentation. My first pepper fermentation project was pretty simple. 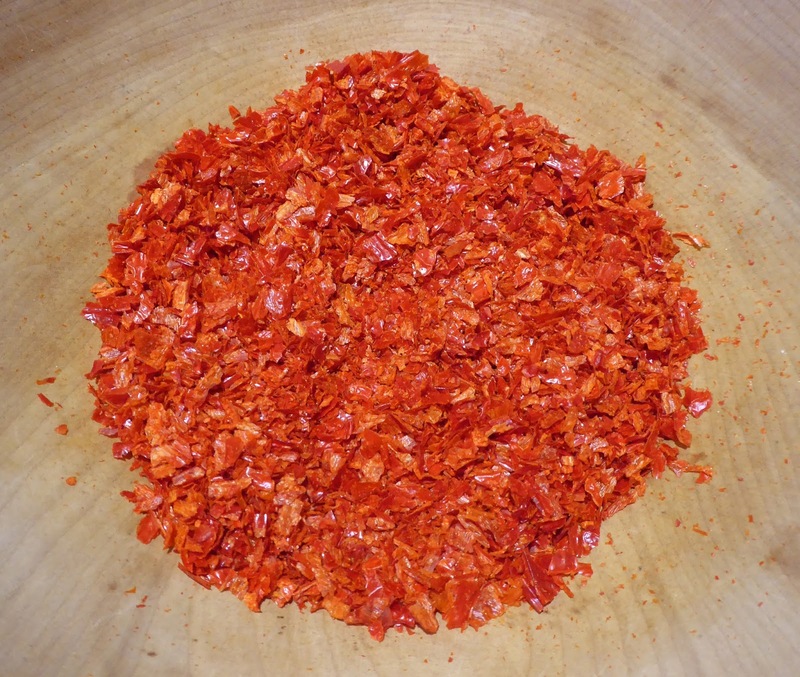 I used the majority of my Aji Angelo peppers to make fermented pepper flakes. I cut the peppers in half, removed the cores and seeds, and fermented them in a 2% brine for about a week. 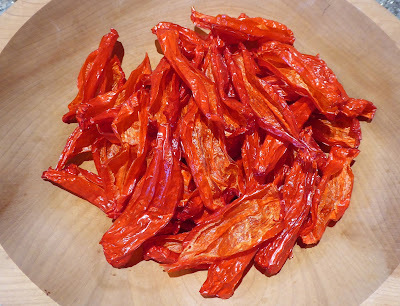 Then I dehydrated the peppers until they were stiff but not too crisp. 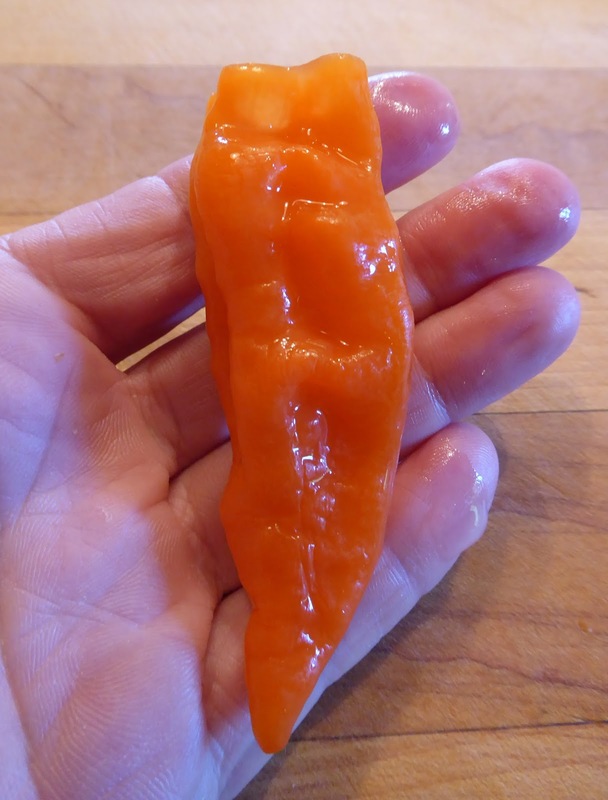 Aji Angelo peppers are mild, fruity, and fragrant and fermenting them seems to intensify the fragrance and flavor. To produce the finished flakes I ran the dried peppers through the food grinder attachment for my KitchenAid mixer. The food grinder produces nice sized flakes without a lot of powder. For long term storage I keep the flakes in the refrigerator but I don't think these will be around for very long because these are the best tasting pepper flakes I've ever had. 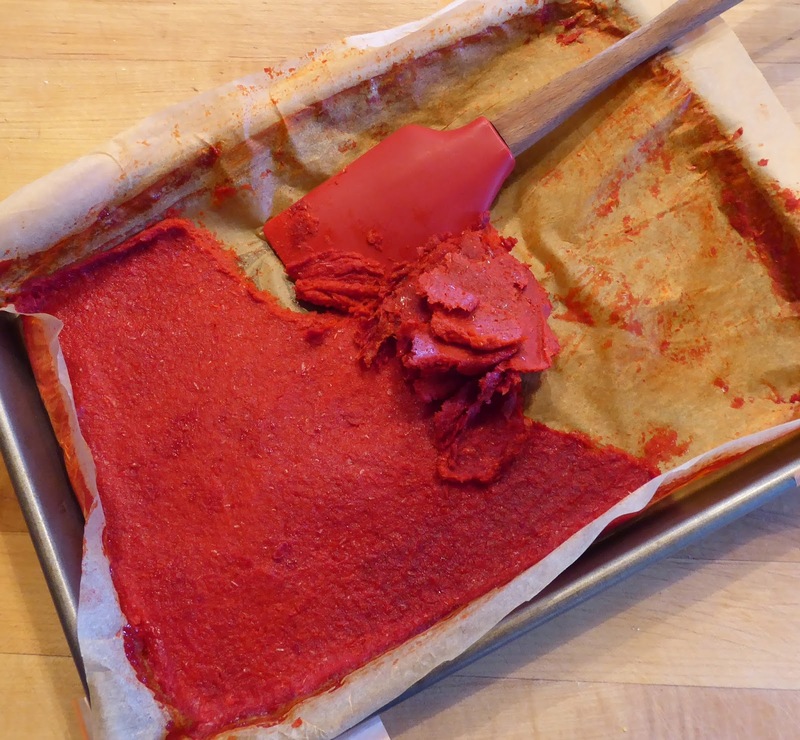 Project number 2 was a thick sweet paste. 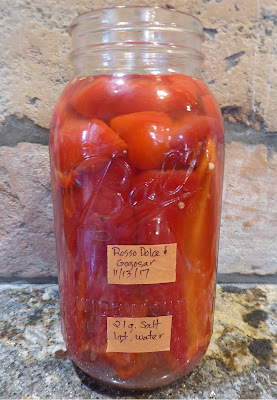 I cored and seeded 2 sweet pepper varieties and fermented them in about a 2.25% brine solution for a week. The fermented peppers were amazingly fragrant. I had someone in to finish off one last little item for my recent kitchen update and I opened up the jar of fermented peppers when he was there and he remarked on how delicious the peppers smelled. They were really tasty too, I sampled a slice of one of the peppers and was really impressed with the flavor. A week in a mild brine produced a pepper that still had some crunch and sweetness with just a hint of tang, they weren't pickled yet but the flavor was much more complex. I blitzed the fermented peppers to a smooth puree in my VitaMix blender and poured the puree into a parchment paper lined half sized baking tray. 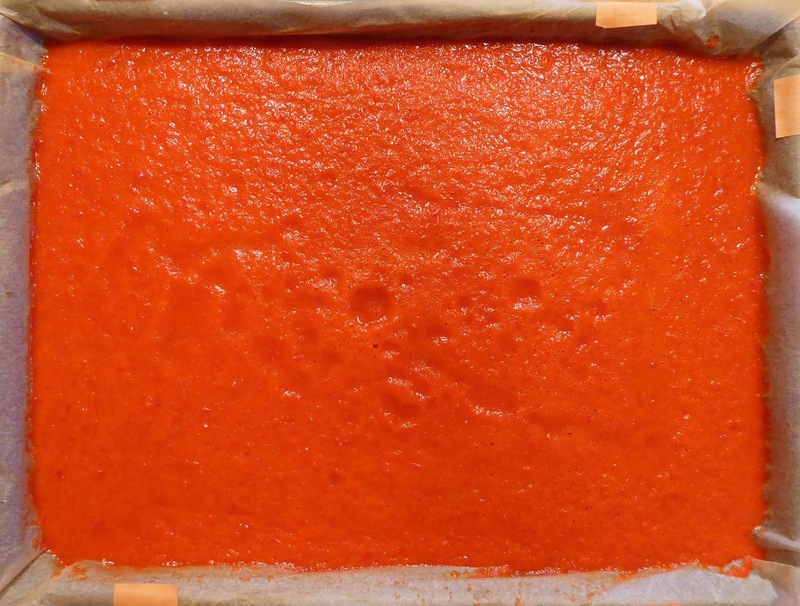 I then dried the puree down to a thick paste at 105ºF in my dehydrator . I was careful to not overheat the paste at any step in the processing so it's still a "live" product so I keep the paste in the freezer. The high proportion of sugar in the paste keeps it from being rock hard so it's easy to scrape out portions with a small heavy duty paring knife. I've got a couple more batches of sweet peppers fermenting now with the intention of making more paste. It will be interesting to see if the next batch comes out a good as the first. I sure hope so. 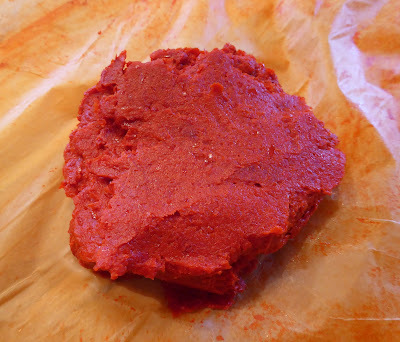 When I was researching how to go about making a fermented pepper paste I came across a mention of a smoky harissa paste which got me wondering if smoked peppers would ferment. I couldn't find any particular formula or method but one recommendation that I ran across was to inoculate the brine with whey. I decided to inoculate a batch of smoked peppers not with whey but with some brine from a batch of successfully fermented peppers and it worked. I halved, cored, and seeded a combination of sweet Ometepe and Jalapeno peppers, smoked them for a couple of hours with apple and almond wood, then immersed them in a 2.5% brine mixed with about 2.5 ounces of brine reserved from the fermented Aji Angelo peppers. 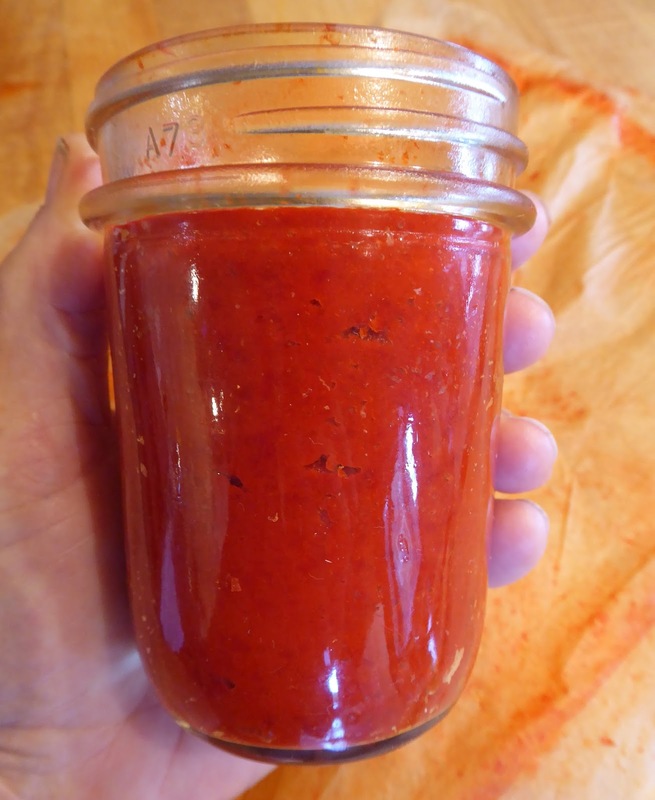 I let the peppers ferment for a week and then drained, pureed, and dehydrated the mixture as I did for the sweet pepper paste. The paste came out mildly spicy and quite smoky, almost too smoky so if I make a smoked pepper paste again I'll either smoke the peppers more lightly or use a combination of smoked and unsmoked peppers. 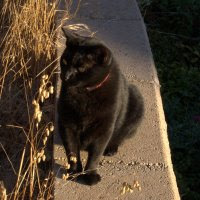 But I haven't actually cooked with any of it yet, just tasted it as I was preparing it, so perhaps the smokiness will not be so strong when the paste is incorporated into a dish. Update December 6, 2017. I tried some of the smoked pepper paste in a dish of chickpeas and spinach in a tomatoey sauce last night and it was wonderful! I used about 2 teaspoons of the paste with what started off as 1/2 pound of dried chickpeas and a half pound of frozen spinach (from the garden of course), a few small Marzano Fire paste tomatoes grated to make a coarse puree without the skins, olive oil, garlic, onion, and a tablespoon or so of homemade tomato paste. The dish was simmered with a good portion of the chickpea cooking water. The smoky flavor was very subtle and the spice just a hint so I think it would have been safe to use even more of the paste. The sweet Habanero pepper that I'm growing has been quite productive but I've not really been sure what to do with all of them. They've been tasty to snack on but I haven't been inspired to cook with them. 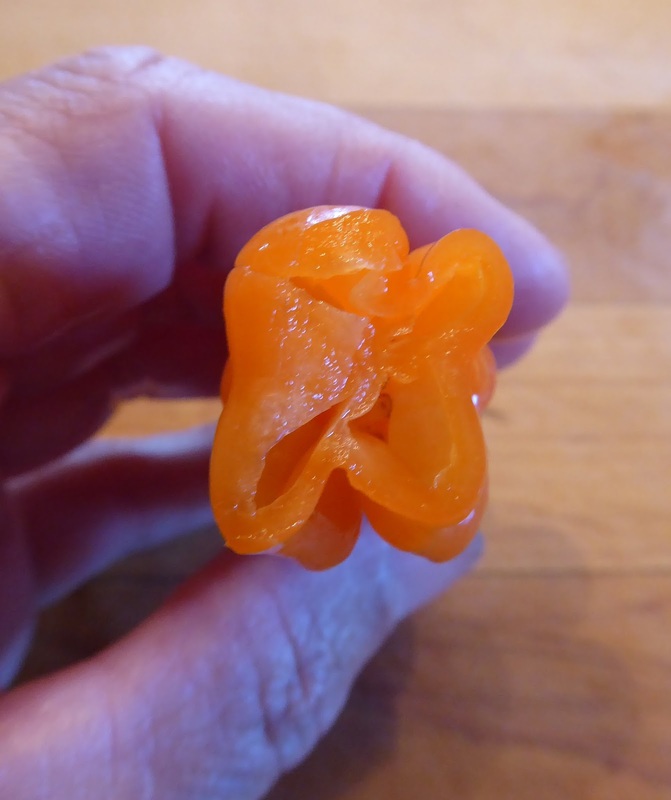 After tasting the fermented sweet peppers that I used to make the sweet pepper paste I thought perhaps that the Habanadas might be tasty if they were fermented a bit. 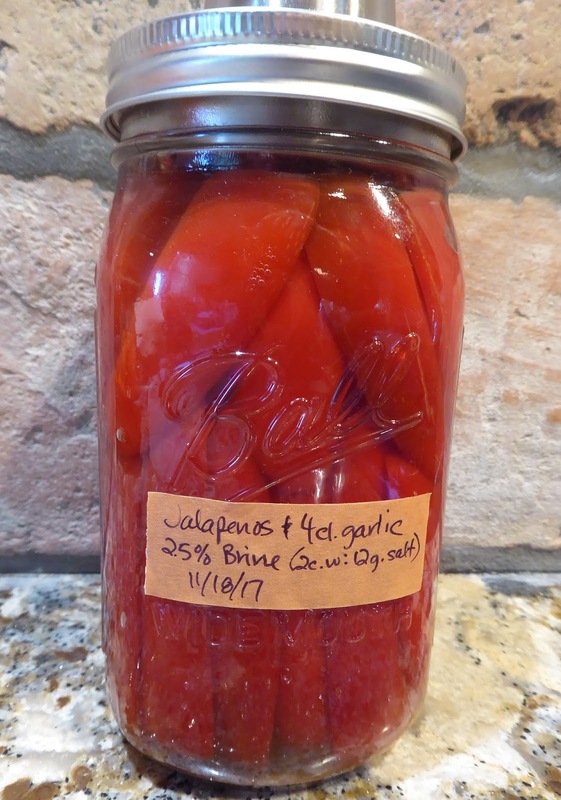 These are totally sweet peppers so I was not at all concerned about removing the cores and seeds so I simply cut the tops off and stuffed them into a jar and used a 2.5% brine solution. After fermenting for a week the peppers still retained some sweetness and crunch and were quite tasty to snack on. Even better though was when I used a pasty bag with a plain tip to pipe some plain soft goat cheese into them and then served them with a dusting of smoked paprika and a drizzle of extra virgin olive oil. I'll be experimenting with other fillings and I will definitely be fermenting the rest of the crop, although I may be turning some of them into fermented pepper flakes. 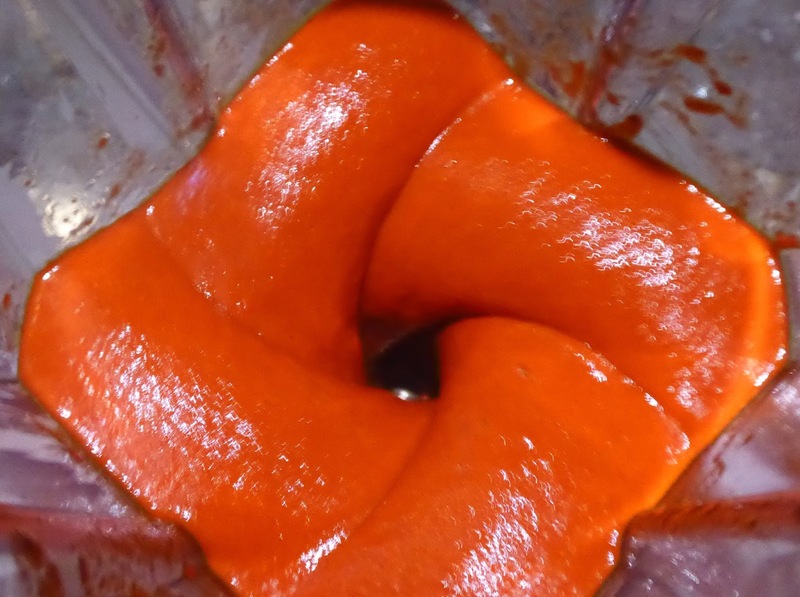 My latest experiment was inspired by Sriracha Sauce, aka Rooster Sauce. I am not much of a hot sauce fan and a bottle Sriracha sauce never gets used up before I toss it because I can't remember how long it's been hanging out in the fridge. So I decided to try making my own mild version. The real thing has garlic in it so I added 4 big cloves of garlic to the jar with the ripe Craig's Grande Jalapeños. Since I'm not a fan of HOT sauce I decided to make a wimpy sauce. Nearly all of the heat in a hot pepper is in the core and the membranes that the seeds are attached to so I defanged (or should I say debeaked?) my peppers by cutting them in half, removed the cores and cut out much of the membranes. I wasn't overly surgical about removing the membranes because I wanted some heat in the sauce. Once again I used a 2.5% brine solution and allowed the peppers to ferment about 10 days. 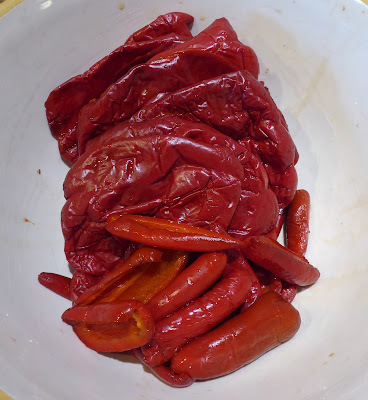 The fermented peppers were a vibrant red color, retained a lot of crispness, and like the fermented sweet peppers had become really wonderfully fragrant with a good hit of garlic on the nose too. Real Rooster Sauce has sugar listed as an ingredient and distilled white vinegar also. I pureed the peppers and garlic together in my VitaMix blender and added sugar to taste which ended up being 4 teaspoons. No way was I going to add distilled white vinegar though, I think it's far too harsh and I don't even keep any around. No, the logical thing to use to thin the pepper puree to a sauce was the brine so I blended in a couple of tablespoons of the brine, poured the sauce out of the blender container and then used a couple more tablespoons of the brine to get as much of the pepper goodness out of the blender container as possible. 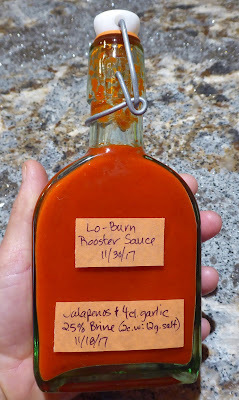 Well, I have to say that I am really impressed with my version of Sriracha Hot Sauce which I've dubbed Lo-Burn Rooster Sauce. It's got a perfect for my wimpy palate mid-tongue hit of heat, just a bit of sweetness, and that incredible fragrance and depth of flavor that fermentation produces. I can and most likely will use my wimpy version with abandon. So I've got one more jar of peppers fermenting at the moment. 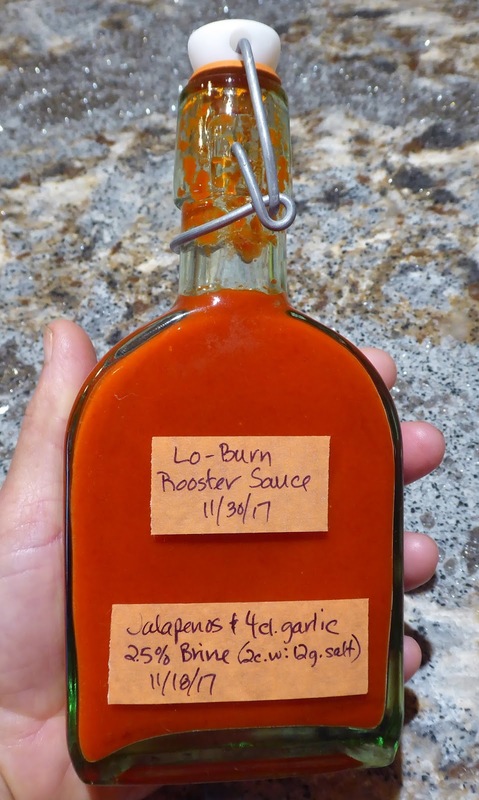 My success with the Lo-Burn Rooster Sauce inspired me to make a sauce with the Aji Amarillo Grande peppers that I harvested last week. And I'm going to try one other thing. I've saved the brine from a couple of batches of peppers which I'm going to use to spice up a batch (or two or three) of Bloody Mary Mix. I like to sip on a Virgin Mary every once in a while and after tasting the leftover pepper brines it seemed like the perfect use for them. And I guess that I could add a few dashes of LBR Sauce too. In the photo above are two air-lock systems that I use for my fermentation projects. The 4 piece stainless steel one at the top is call Kraut Source. The three piece ceramic and plastic one at the bottom is called Ferment'n. 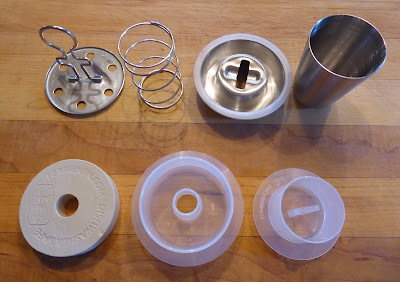 Both also require a mason jar ring to secure them to a wide mouth canning jar. 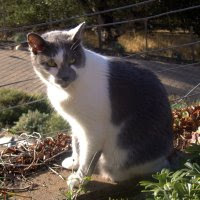 I like to use an air-lock system because it really reduces the chances of your vegetables getting moldy, especially if you are using a mild brine solution like I chose to use with my peppers. I don't want to have the experience of taking months to grow and harvest a batch of peppers and them have them go moldy in the fermentation jar. My favorite of the 2 systems is the Kraut Source and that's simply because, and this is kinda silly, I like to hear the clink of the metal cup as the gases from the fermentation push the cup up and then it falls back down. Clink! Clink! It's the surest sign that the yeasty beasties are at work. Both systems are available from Amazon. Ooh, you know this topic is a favorite of mine! 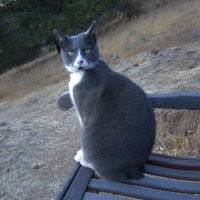 And so many good ideas here, I need to pin this post. I've never tried a fermented pepper paste, so I definitely want to try that next year if the peppers cooperate. I've settled on the pepper flakes and sriracha sauce as my most-used fermented pepper products. Last year I had abundant supplies of Aji Angelo and Aji Golden and used them for flakes and sauces. Both made a tasty mild 'lo burn' sriracha that I really enjoyed. I used rice vinegar but next time I'll have to try a bit of the brine like you did. And for flakes I'll have to use the food grinder - what a great idea! Also, I'd like to try your fermented smoked peppers, and maybe make a hot sauce with them too. 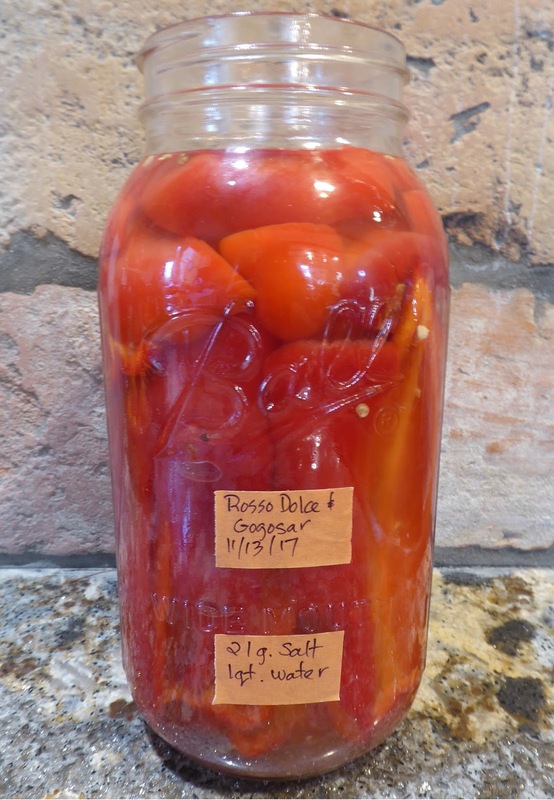 I've had people suggest I make a hot sauce with smoked peppers, but fermenting would definitely give them another level of flavor. 87 pounds of sweet peppers is amazing too. 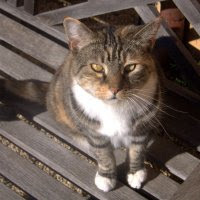 I was tickled last year with 33 pounds, but this year we got only 17 pounds and had none to preserve. You have the sort of pepper harvests that we can only dream about and so many ways of using them. Oh, I love this post - so many wonderful ideas! Who would have thought to ferment peppers, then make pepper flakes? And using the Kitchen aide attachment is genius! I find it quite tricky to get nice flakes using the spice grinder. Even though I have purchased a couple of books on fermentation, this year has just not been conducive to trying it out with everything on my proverbial plate. It was a bad pepper year, so in a way it worked out as I didn't have a whole lot of excess to experiment with anyhow!